February was such a busy month that it wasn’t worth me posting a reading update, but I am happy to share my February AND March reads today. Though it is just three books, it is three AWESOME books. I’ve had a streak of great luck in the fiction department, so if you are a fiction lover, you are in for a treat. The Light Between Oceans : I can’t put into words how much I loved this book. The story has haunted me for weeks after reading it. It takes place in the early 1900s in Australia. It tells the story of a young husband and wife who live on a remote island and take care of a lighthouse. They lose three babies in their marriage, so when a boat washes ashore with a dead man and a newborn in it, the wife thinks it is a gift from God. As the years go on, their choice to keep the baby wrecks havoc on their lives. I don’t want to give too much away, but if you read one book from this list, read this one. You will not be disappointed. 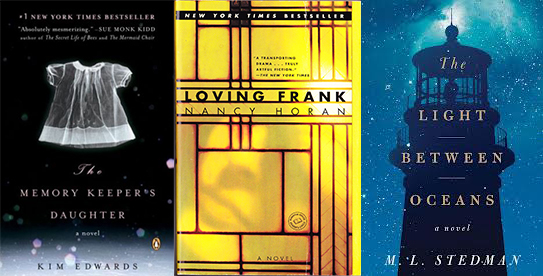 Loving Frank : My friend Laura recommended this book awhile ago and her words about the ending totally shocking her kept ringing in my head as I read it. This book felt a little slow in parts to me, but overall I loved it because THE ENDING!! What is especially incredible is that it is true, true, true which makes it all the harder to believe. I won’t spoil it if you haven’t read the book or don’t know the story (I didn’t), but if you like good historical fiction, this is a GREAT read. The Memory Keeper’s Daughter : I have heard great things about this book for years, but never read it. I stumbled on it at the used bookstore and when I finally picked it up, I couldn’t put it down. I read the first 100 pages in the bathtub in one night. The story flies and it is a really wonderful book. Now I need to watch the movie to see if it compares. Today I’m headed to New York City for a work-conference and then next week is our Disney trip, so if you have any must-reads while traveling, please share in the comments section. What have you been ready lately? Lots of Kleenex on hand. Thanks for these suggestions. Lately, my husband has been hitting up rather heavy books on the Bible and biblical history/inspiration (two by Bart Ehrman and one by John Shelby Spong), and he’s asked me to join his studies. I told him that when I’m done with the Spong book I am currently reading, I need a break for good fiction. Now I have a place to start! As far as travel books go, I recently read two that I can’t recommend enough (which I’m guessing you’ve already read…): _The Giver_ by Lois Lowry–this is y.a. lit, but it is ah-mazing. It is a quick read, but definitely a page-turner/husband-shusher (don’t ask how I know…). I think a movie based on it is coming out soon, so there’s that, too! The second is _Love Does_ by Bob Goff. Really impacted my life and how I see the world. I’ll bet your husband will be interested in my husband’s new book (coming out in August) Our Great Big American God.